You've spent lots of time, effort and money making your backyard pond into a peaceful oasis where you can sit and enjoy watching your koi and other fish swim in the water. Unfortunately, you may not be the only being in the area who enjoys your pond. Predators such as skunks, raccoons and herons may decide to make a snack out of your precious fish. Skunks do eat fish and may be tempted by your koi pond, but when koi go missing from a controlled environment, the most likely predators are either herons or raccoons. Skunks will catch and eat fish, but they're more likely to go after land-based foodstuffs first. Skunks aren't particularly aggressive, but may be tempted to snack on your koi by the easy availability of the food source, especially if the skunk is already using your koi pond as a source of fresh drinking water. Skunks may leave signs of their activity behind, such as the partially eaten body of your fish. If you've seen skunks in the area or smell a strong musky odor, or if skunks spray in the area around your koi pond, a hungry skunk may be to blame for your missing fish. If the area around the pond is disturbed or even damaged, your predator is likely to be a skunk or raccoon. Herons are notorious for eating koi, but they rarely damage the surrounding area. 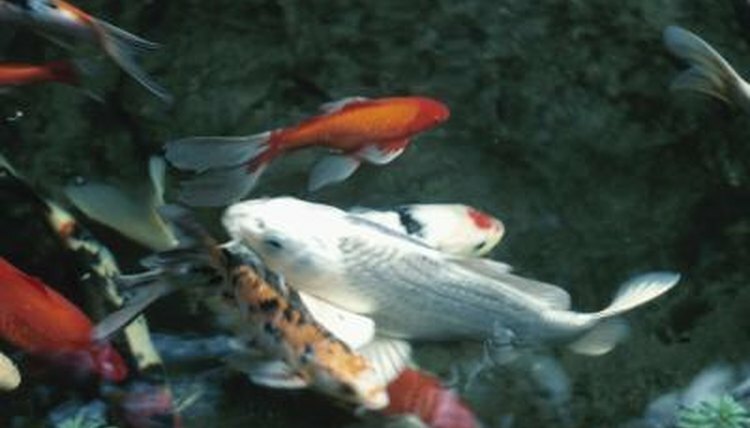 Keeping skunks away from your koi pond is the most effective way of keeping your fish safe. An assortment of different measures can be used to discourage skunks from visiting you, but the most effective is to build a sturdy fence around your koi pond. The fence should not have any large openings and should be build at least a foot into the ground to keep skunks from digging beneath it. Other possible deterrents include statues of fake predators and motion alarms that make noises or cause lights or water sprays to activate when triggered by the approaching skunk. In some circumstances, you may need to have the skunk trapped and removed from your property. Safe traps use bait to capture skunks without harming them. Have a professional handle trapping and relocating skunks from your property. Professionals can better avoid being sprayed and are up-to-date on all local laws and restrictions for relocating wild animals.